A family summer vacation on the Costa del Sol offers much more than sun and sea. Who wants to escape the daily grind and hang out with his loved ones in the reviving summer sun, will be in the right place in Malaga in southern Spain. The very friendly and cheerful manner of the locals also contributes significantly to the holiday mood. Historically interesting cities, white villages and the sparkling blue Mediterranean Sea – a summer vacation with family in Malaga is exciting and varied. On a tour through the province you can discover the original white villages. However, the beach should not be neglected. For a beach holiday with the family is best suited the Costa del Sol in Andalusia, because there are many family hotels with child care and exciting leisure facilities. Also surfboards and pedal boats can be rented everywhere. There are regular courses offered for watersports – so anyone who has ever wanted to learn surfing, diving or boating will find it here. 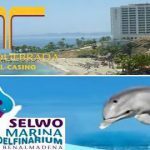 The Sea Life in Benalmadena shows more than 5,000 different species of animals from the great oceans; in Selwo Marina Benalmadena, you can see dolphins and sea lions up close and not far from Torremolinos is situated the Crocodile Park, where you can marvel at more than 300 crocodiles and alligators. Particularly fascinating is to watch the predators feeding.